6th April 2018, New DelhiWith more than 1.5 million schools, the Indian school education system is one of the largest and most complex in the world. It was once considered amongst the best and has produced some great minds every now and then. But due to lack of flexibility and innovation, it has now stagnated. The greatest problem which has emerged is being bounded under a set system, a given course/syllabus and a set pattern for everything which each and every child has to follow. 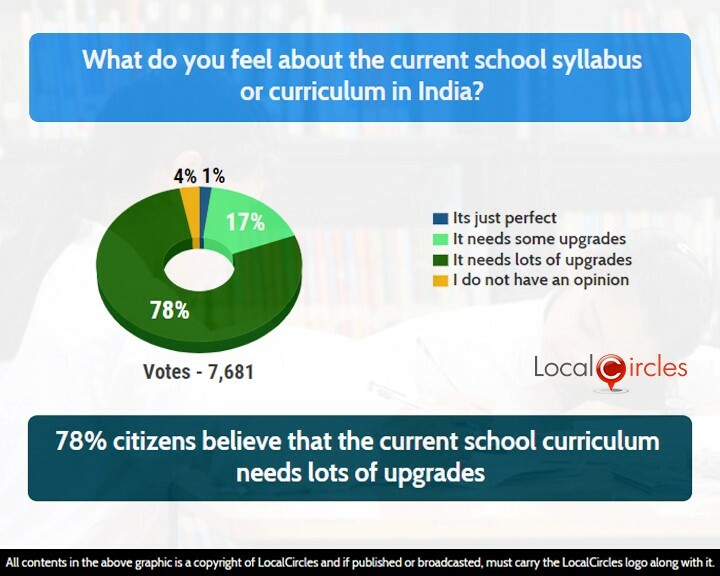 LocalCircles conducted a survey to understand what people feel about the current school education system in India and what could be done to improve it. The survey received more than 42,000 votes. 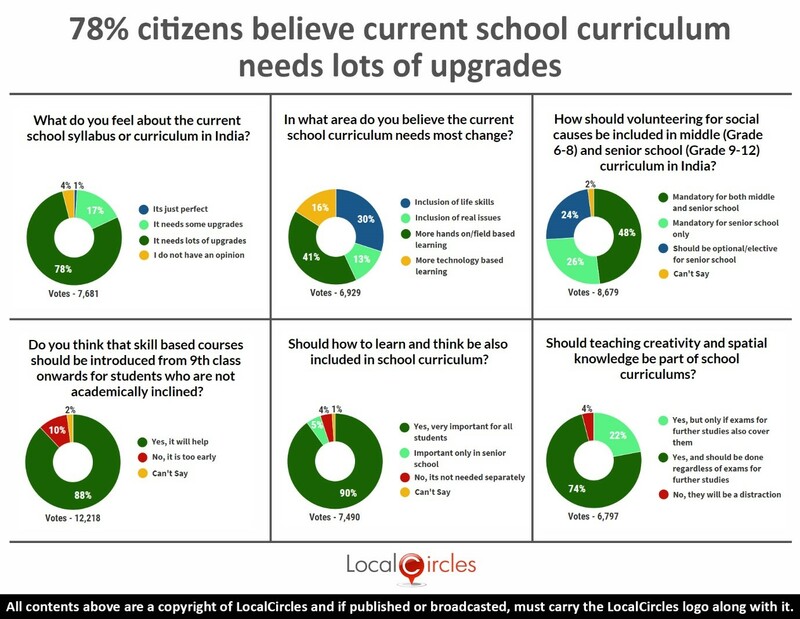 In the first poll, 78% citizens said that the current school curriculum in India needs lots of upgrades. 17% said it needs some upgrades while 2% said the existing system is just perfect. 4% did not have an opinion. HRD Minister Prakash Javadekar recently said that the ministry is seeking to halve the school syllabus prescribed by NCERT and CBSE in schools, stating that there is an urgent need to rationalize the school curriculum to reduce the burden on students. 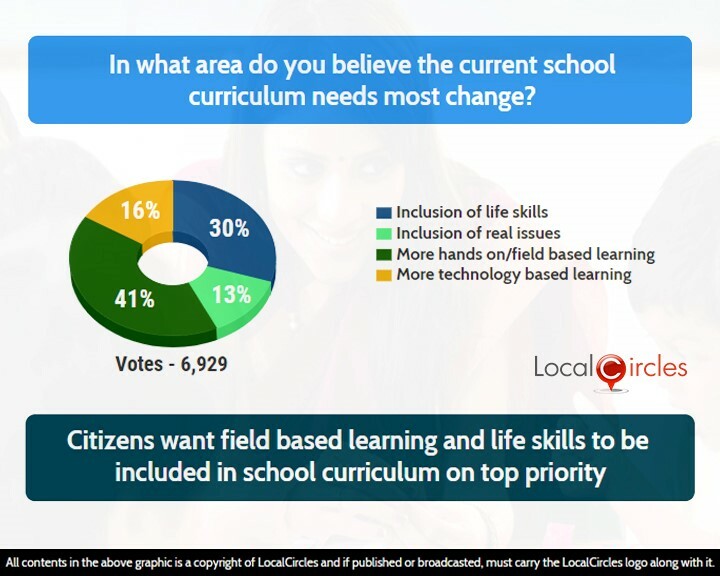 The second poll asked citizens areas in which the school curriculum needs most changes. 41% said more hands on/field-based learning, 30% said inclusion of life skills, 16% said more technology-based learning and 13% said inclusion of real issues. Rote learning has been a demon for as long as we can remember. Everything has been about rote memorization, leading to behavior which encourages cramming and forgetting rather than life-long learning. Many IB schools across India are now trying to bring in interactive education to develop the senses of children at a young age. But at the end of the year, it all ultimately comes down to the method in which students are marked. The marking system needs to be re-looked at or completely scrapped. 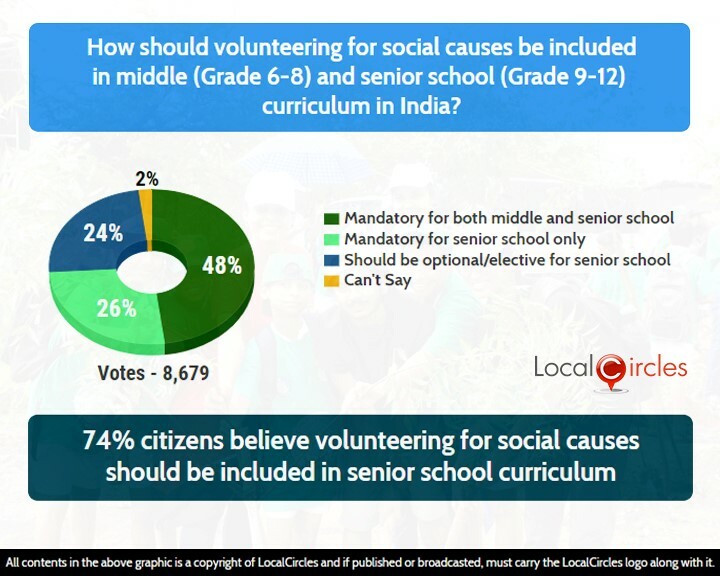 In the next poll, 48% said that volunteering for a social cause should be mandated for both middle and high school while 26% said it should be mandated for senior school only. 24% said it should be optional for senior school while 2% were unsure. 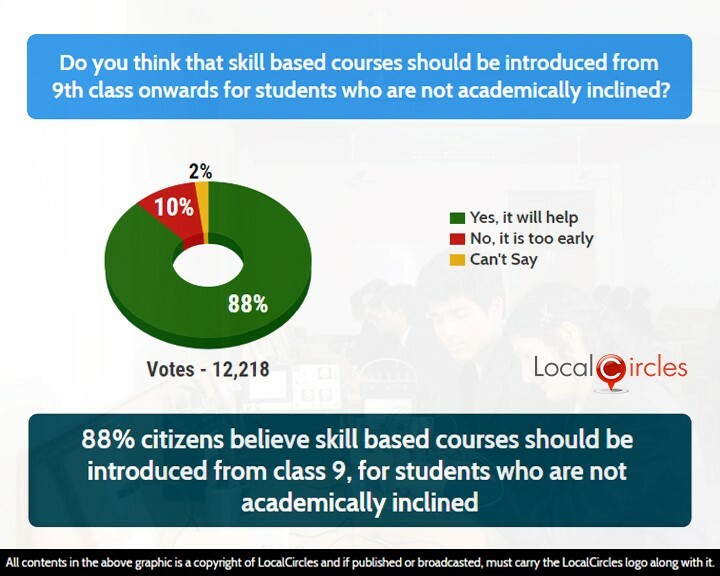 In the following question, 88% citizens believe skill-based courses should be introduced from class 9 for students who are not academically inclined. 10% voted against it saying it was too early. The objective of school education is to prepare a good human being from the system. Along with academic education, life skills, experiential learning, physical education and creative skills are also needed. 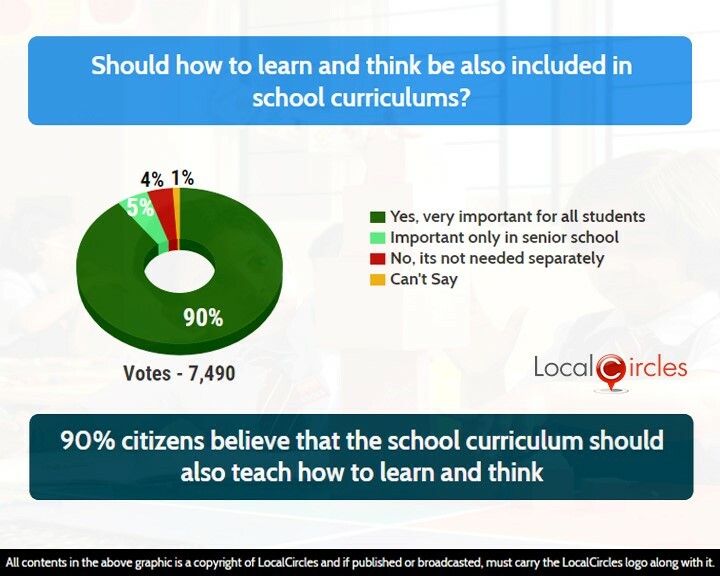 90% people in the penultimate poll said that it was very important to include ‘how to learn and think’ in the school curriculum. 5% said it was important only in senior school while 4% said it is not needed separately. 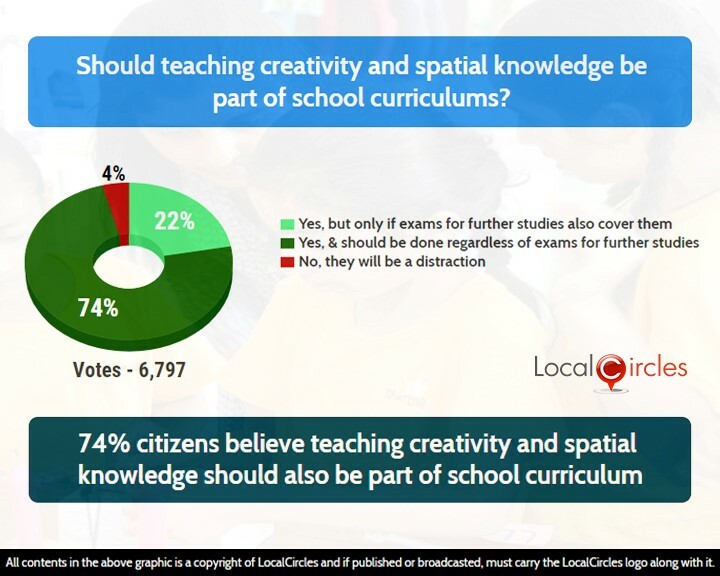 The final question, 74% citizens said they believe teaching creativity and spatial knowledge should also be a part of the school curriculum and should be done regardless of exams for further studies. 22% said it should be included only if exams for further studies also cover them. 4% said it will be a distraction for children. Lack of diversity in the subjects you can study after school is also an issue. For example, one can't double major in Math and German like they can in the USA. Many experts have been saying that we should take a cue from the Finnish model of school education, which focuses on the flexibility of curriculum, individual pace of learning and high-salaried, rigorously trained “quality” teachers. Statistics indicate that there is a dangerous deficit of quality school teachers in India. A copy of this report is also being sent to the Ministry of HRD so that they could be acted upon.